Charles Jenkins literally carries a burden on his back. And it has nothing to do with basketball. The junior guard on the Hofstra University men’s basketball team wears No. 22 in honor of his brother, Kareem Albritton, who in 2001 was shot and killed in Brooklyn at the too-young age of 22. The violent death of a family member is something you never really get past. Just ask his coach, who understands better than most because he endures the weight of his own loss. Jenkins can’t escape his past. He knows this. His coach knows it. All the Hofstra star can do is acknowledge and honor it. So Jenkins, 20, embraces this fact, melding the tragic with the remarkable. When he became the first sophomore since Chris Mullin of St. John’s University in 1983 to win the Haggerty Award as the New York Metropolitan area’s best basketball player, he used the opportunity to speak about his fallen brother. The 6-foot, 3-inch, 220-pound Jenkins plays with a drive that’s transformed him into one of the nation’s top guards and turned Hofstra into a contender. The Pride will challenge for the Colonial Athletic Association title and berth in the NCAA Tournament after going 21-11 a year ago. It began on the road in November against No. 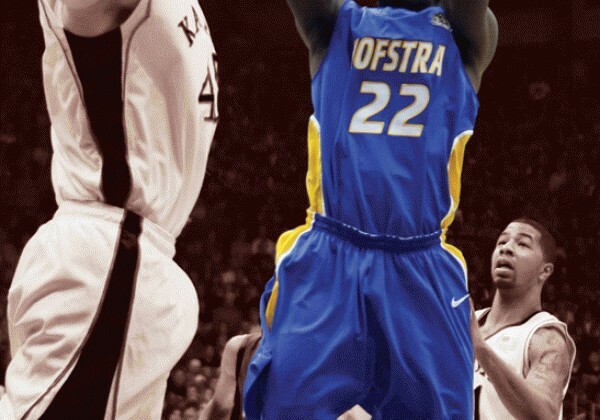 1 Kansas, the first top-ranked team Hofstra had ever faced. Kansas routed the Pride, 101-65, but the experience proved invaluable. Then came a loss to perennial Big East power and 12th-ranked Connecticut, a game that the Pride actually led with 4:15 left. No one has played a tougher early-season schedule. And facing the likes of Kansas guard Sherron Collins and UConn guard Jerome Dyson, each seasoned seniors with national reputations, Jenkins proved he belonged on the same stage. If Hofstra earns its fifth 20-win season over the last six years, it will be because of lessons learned facing these heavyweights in November. Pecora has a disciple in Jenkins. The guard was born in Brooklyn, but grew up in Rosedale near Green Acres mall and starred at Springfield Gardens High School in Queens. St. John’s showed interest, but the Hofstra coaching staff found Jenkins early and developed a relationship that bloomed. Mining for guards is a Pecora specialty. Coaches fell in love with Jenkins’ physical presence and work ethic. And at a mid-major program like Hofstra, outhustling and outmuscling the big boys is how you win. Jenkins is a hard-driving, physical guard who is a magnet to the basket. Jenkins, an All-CAA player as a sophomore, is the only returning player in the country who averaged at least 19 points, four rebounds and four assists per game last year. And he’s put up similar numbers for the Pride this season. He became just the second player in program history to crack 1,000 career points as a sophomore and is on pace to finish his career as Hofstra’s all-time leading scorer. But the only statistics Jenkins cares about are wins and losses. As the leader of the Pride, it’s a responsibility on Jenkins’ shoulders. When you consider his weighty past, you realize there’s nothing he can’t handle. Jenkins stares down bigger demons each time he slips on his No. 22 jersey, a reminder that every day is precious.